We bought a grey sofa last week and now I’m thinking that the logical next step is to replicate the living room pictured above piece-for-piece. I especially love that rug! GQ – Dwayne Johnson for President! Is there a reality series about Dwayne Johnson in the works yet, or is he too busy making what seems like seventy movies a year? Because I would watch that very, very much. Oh, it’s just too real. This interview with Victoire Dauxerre (former model and the author of Size Zero: My Life as a Disappearing Model) is a worthwhile look at the toxic ideals of beauty prevalent in the world of high fashion. France has introduced laws that ban fashion houses from using “excessively thin” models and require ads and magazines to add a “photographie retouchée” (retouched photograph) label any Photoshopped image, but it’s going to take a long time for the culture of modelling to change in a significant way. “After breakfast, I always go for a walk on the beach from 8 to 9. It’s a great way to start the day.” Preach, Ina. This sounds like a really good way to become a morning person. 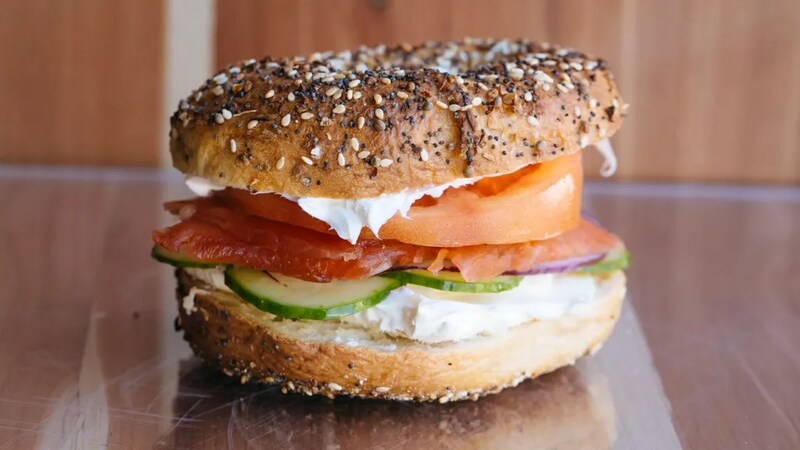 I NEED this lox sandwich (above) from Philly Style Bagels. Anyone up for a road trip to Philadelphia? “The terrible thing is I tend to run things into the ground. That’s why I’ve got to make something so calamitous. I’ve got to run it off a cliff.” Wow, this is … so much. Spoiler alert: it’s not pretty. Celebrate Mexican culture with recipes for all the drinks, cakes, and (of course) tacos you could ever hope for. It’s Mental Health Week! Seeing as baking is proven to be good for your mental health, I wanted to celebrate by sharing one of my favourite baking recipes: No-Knead Bread. Like most novice bakers, I thought making bread would be too difficult to master. The stakes seemed much higher than they did for cookies or quick breads. I was afraid of failing after dedicating so much time to making a loaf of bread, so I avoided it. But as my baking skills improved over the years, I wanted to try something more challenging. Enter no-knead bread. The recipe I’ve shared below is a mash-up of other recipes, namely Mark Bittman’s recipe from the New York Times, Mark Bittman’s recipe from How to Bake Everything (which has different proportions), and The Kitchn’s no-knead bread recipe. My first few loaves had problems (too gummy, too bland, unsatisfactory crust), so in an obsessive quest to resolve these issues, I turned bread into a science experiment. This is my recipe for no-knead bread. I have baked this bread repeatedly and adjusted the recipe to suit my idea of what a perfect loaf looks and tastes like. That’s the cool thing about bread: it’s part science experiment, part magic. The slightest adjustments can yield different results. It’s all good, though; in the end, you have bread. You can make delicious bread, too. No-knead bread isn’t difficult, and you don’t need any fancy equipment, but it does take time; this recipe will take 22-24 hours from start to finish. Most of that time is hands-off, obviously, but if you’re baking bread for a specific occasion, be sure to start your dough early enough to avoid disappointment! If you put a batch of dough together before you go to bed tonight, you can have this bread for dinner tomorrow. And finally, remember to trust and believe. This yields a very wet, slack dough that may look different from what you may have seen elsewhere. As long as your yeast is working (you’ll be able to see and smell it), then you’re on the right track. Don’t give up! I’ve made variations of this salad before, and it’s always delicious. 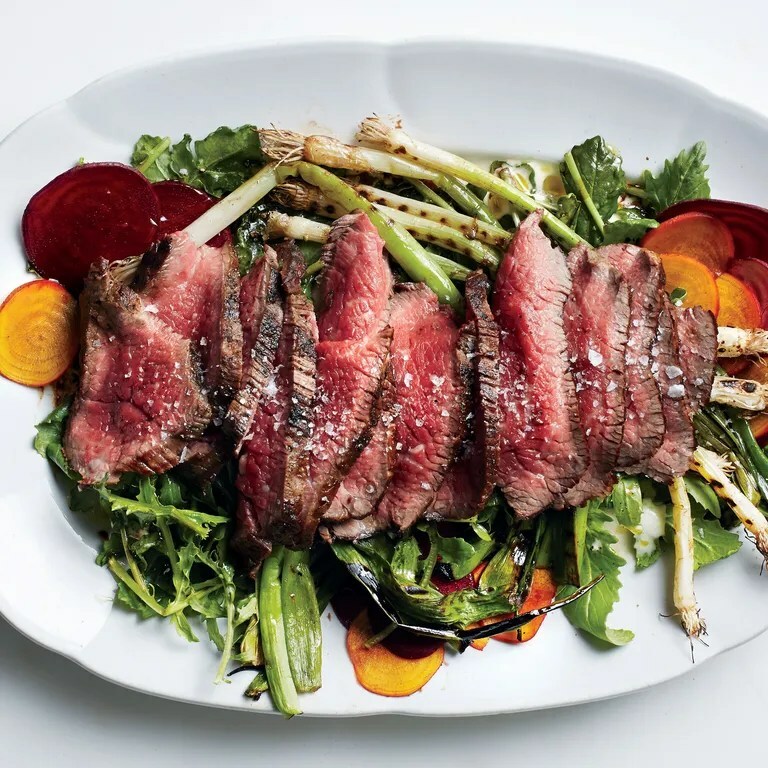 Use a mixture of greens you like, and go for skirt steak if you can find it — despite its reputation as a tough cut, skirt steak is really tender when cooked to medium-rare and cut against the grain, plus it’s usually less expensive per pound than strip steak. Hint: it has nothing to do with subpar produce. Thanks to low overhead and their proximity to distribution warehouses, Chinatown produce vendors are able to pass on savings to their customers, as well as offer a wider selection of fruits and vegetables that are difficult to find elsewhere. Bring a reusable bag and experiment with produce you’ve never tried before! A great read for anyone looking to get a more nuanced understanding of the challenges refugees face when arriving in a new country. “The ceremony begins at 10 a.m. on a Wednesday morning, because Disney weddings happen ’round-the-clock … Brides and brave-faced loved ones arise as early as 3 a.m. to begin hair and makeup prep, employing glam squads whose typical call-times occur in the middle of the night. The guests, too, rise promptly — weddings that take place inside Disney’s Florida theme parks begin two hours before regular parkgoers enter, which means they can start as early as 7:30 a.m., or two hours after parks close.” This is next-level commitment. 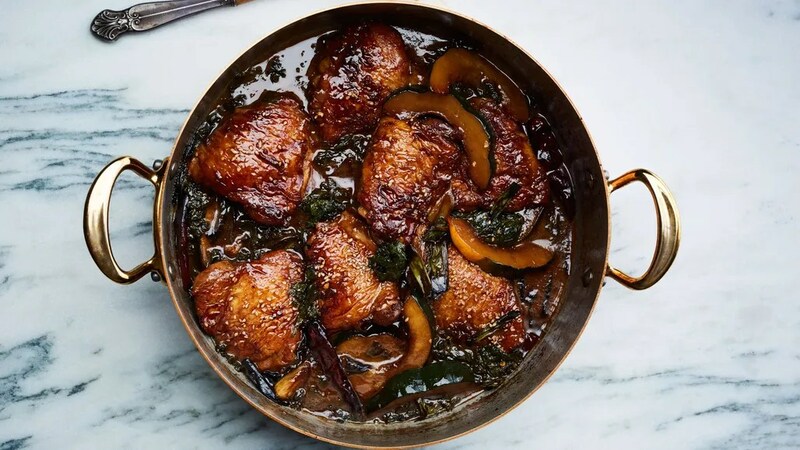 This is more of a cold-weather dish, but this spring has been all over the place and I think I have at least one more weekend of slow braising ahead of me before we (finally!) set up the barbecue for the season. Have you ever noticed that it’s much easier to help a friend see their strengths and talents than it is to recognize our own? Why is that? We may never be able to completely escape our negative or anxious thoughts, but we can certainly learn to control them. One strategy: consider what advice you would give to a friend in a similar situation, then apply it to yourself. Deep breaths! We can do this. This author’s account of moving her family from Ontario to Tanzania is far from the Eat, Pray, Love-esque travelogues we’ve become accustomed to seeing in the past few years, which is refreshing (not to mention incredibly anxiety-inducing!). Would you ever make such a huge, life-altering decision without a back-up plan? Wooow. Ijeoma Oluo’s patience is unparalleled. This whole conversation seems like it required nerves of steel. High Park Zoo – Help Name the Baby Capybaras! The High Park Zoo’s three new #capybabies need names! You can submit your suggestions on the Zoo website until May 3rd; voting begins May 8th. If you missed National Grilled Cheese Day on Wednesday, catch up this weekend with one of these delicious-looking sandwiches, including the Époisses Grilled Cheese and Pepper Jelly Sandwiches (above), which I need in my life immediately. October 2015 was a heady time: “Hotline Bling” was on heavy rotation, Obama was still President, and the Toronto Blue Jays won the 2015 American League Division Series over the Texas Rangers after a controversial 53-minute seventh inning in Game 5 that had everyone in our neighborhood bar gawping at the screen, occasionally breaking the silence to ask, “what in the hell is going on? !” MLB.com columnist Joe Posnanski and Parks and Recreation co-creator Mike Schur recap “a game NOBODY HAS EVER SEEN BEFORE” in what is definitely my favourite piece of sports writing ever. The High Park Zoo: come for the cherry blossoms, stay for the #capybabies! Stereogum – What Happened To Ludacris? Ludacris got married in 2014, is currently worth an estimate $25 million dollars, and has a huge movie coming out this Friday, but something tells me that wasn’t really the point of this question. This feature on Sam Siatta, a veteran Marine who committed a violent crime upon his return from serving in Afghanistan, is one of three NYT pieces to win a 2017 Pulitzer Prize. It’s a sad story about PTSD and the cost of warfare, but worth your time this weekend. I have a bit of an obsession with limited-edition holiday-themed snack foods. Spotting Pumpkin Spice Oreos or Snowflake Ritz Crackers at the grocery store definitely makes my heart beat a little faster. So when I came across Spring Pastel M&M’s in the candy aisle a few weeks ago, I couldn’t help myself. I knew they’d would make cute cookies for Easter, so I threw a bag into the cart when Adrian wasn’t looking and hid them away until the snow (finally) melted. M&M’s are an excellent cookie mix-in because they don’t melt or burn easily, the colours are really fun, and they’re not too sweet in small quantities. Use a stand mixer (or handheld mixer) to cream the butter and sugars, and take your time — spending several minutes on this step helps ensure that your dough is well-aerated, which will help you achieve a great texture in your final cookie. How amazing does this danish look? I’m visiting family next week and can’t wait to make this for brunch on Easter Sunday. I’m six feet tall and mildly claustrophobic, so unless I’m traveling with two other friends in my row, I always book an aisle seat to avoid hours of anxiety and battles over the armrest. This new, wider middle seat design looks like a great concept and I hope to see it on planes in the near future — I’ll probably still choose an aisle seat, but at least I won’t feel so badly for the person in the middle! A fascinating glimpse into how the witness protection program changes someone’s life. It’s been almost two months since I started my bullet journal in the hopes of getting more organized at home, so I thought I’d do a quick accountability post. Here’s how my bullet journal adventure is unfolding so far! Overall, I really like the process of using my bullet journal. It took me a while to get the hang of it, and I’m still refining the process to make it work for me — I have a tendency to spend way too much time doodling, which isn’t a problem when you use an electronic calendar — but the benefits of using a paper method are becoming very clear. I use my bullet journal primarily to track my habits. I experimented with a few different layouts before landing on the one I used for my April 2017 habit tracker (above). It makes it really easy to see how consistent I’m being over the course of the month.